Since the bicycle came on the scene in the early 19th century, it has served many purposes. It has served as a mode of transportation, as well as a means to burning calories and getting exercise. Some have even described it as a powerful agent as social change, such as Susan B. Anthony, who said, "The bicycle has done more for the emancipation of women than anything else in the world." While the bicycle is fairly standard in concept, it has undergone some major design changes throughout the years. One of those redesigns, which goes back to the early 1900s, is the recumbent bicycle. Instead of sitting erect as one does on traditional bicycles, the recumbent bicycle allows one to sit in a recumbent position, with the legs stretched in front of the rider, instead of underneath the rider. The seat can be adjusted forward or backward, depending upon the height and leg length of the rider. Recumbent bicycles are popular on the roads, and stationary versions are popular in the gym. 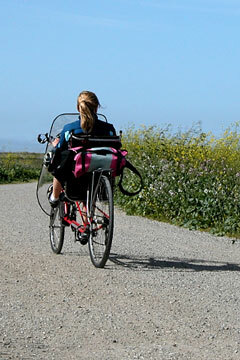 Why would someone choose a recumbent bicycle over a traditional bicycle? Well, the main reason recumbent bikes are popular is that their design allows for a very comfortable ride, as the seat provides superior support to the back. Fans of the recumbent bicycle also say it is safer than traditional bikes. The low center of gravity and the position of the rider allow him to brake more easily in a collision or near collision. If a collision does occur, the secure seating arrangement means the rider is less likely to get thrown off the bike. Finally, if there is a collision, the feet will most likely take the brunt of it, rather than the head or body. There are three basic types of recumbent bicycles: those with a short wheel base, those with a long wheel base, and those with the pedals ahead of the front wheel rather than behind it. A semi-recumbent bike is a type of cross between a traditional bike and a recumbent bike. A semi-recumbent bike has a front wheel that is smaller than the back wheel, and the rider's legs, instead of being positioned either straight in front or straight down, are positioned at a 45-degree angle.